The diversity of our professionals and their connections to the academic world enables CPI to be a thought leader. CPI professionals are all highly experienced and driven. This creates a unique dynamic and stimulates talent development within our fields of expertise. 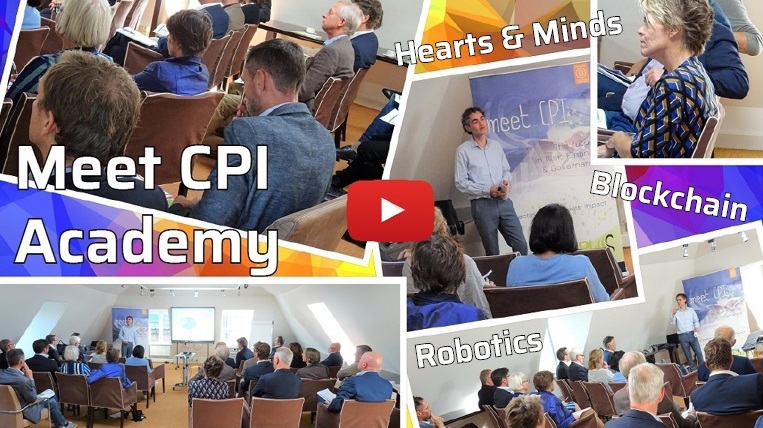 A number of partners and professionals actively pursue the opportunity to exchange knowledge between the practice of CPI and their academic role, for instance at the Vrije Universiteit Amsterdam, the Business University Nyenrode and the University of Amsterdam. CPI professionals publish articles and books and are keynote speakers at seminars. We like taking the lead, together with our clients during practical challenges and by investing in our subject matter expertise. CPI has the ambition to be thought leader in risk, finance and governance. CPI invests in enhancing knowledge and innovation for the benefit of our clients as well as professionals. CPI has high standards for education, not only with regards to the initial Master’s degree of our professionals but also as part of their ongoing training. CPI Academy facilitates the development of professionals, with an emphasis on sharing, broadening and enriching their knowledge. In addition, CPI Academy ensures there is ample inspiration and interaction during training and Think Tank sessions. What started as an investment in our own professionals has developed into a highly sought-after service for our clients. CPI Think Tank "Business Control and added value stream mapping"
Think tank with a select group of leading experts on the most recent practices in Risk management and Internal Control Frameworks (ICF). Led by Ridder Ralph van der Hoff and Charlotte Beekenkamp with interesting case studies. How can risk management and the implementation of ICF benefit from the "tone at the top"? The discussion shed new light on the approach and actual implementation of ICF and the essential role of the "tone at the top". Round Table "Future of ethics in the financial sector"
CPI organised this Round Table together with DLA Piper in honour of their 100-year anniversary. An inspiring debate with leading directors from the financial sector was moderated by Pauline van der Meer Mohr (i.a. supervisory board member of HSBC) on 'the future of ethics in the financial sector'. Learn more about our activities? Contact the CPI Academy team via CPI-Academy@meetcpi.com or call us at +31 88 10 10 200.